The project prolongs my incorporating of music into the visual arts medium. The project is tied to the so-called »selfbuilding« phenomenon which gave rise to the one-family housing objects – these were typical for the socialist era in Slovenia and have visibly completed the urban/cultural landscape of the 1970s and 1980s era. This process was related to the improved relative material well-being (regular salaries, higher access to credits, attainability of good properties, materials). Immediately after 1945, in the so-called »udarnik« period, a lot of urban infrastructure (from county houses to roads) was mainly built in a collective context. The 1970s and the 1980s were time of the individual building projects. A part of the inventory in numerous apartments of flats is still a cement mixer which remains a part of the parents’ house equipment as well. During the operating of the mixer, I tracked down the specific sounds of the cement processing. The roaring noise of sand, cement and water in the concrete mixer-lorry folded up in a construction building sound composition. The pianist then added his music improvisation to the sound of the construction machine. The mole intonation of his melody passes over to the dur tonality. In spite of the seemingly more lively, light and melodic art of the pianist, it is possible to see beauty also in the rattling sound of the preparation of the concrete. 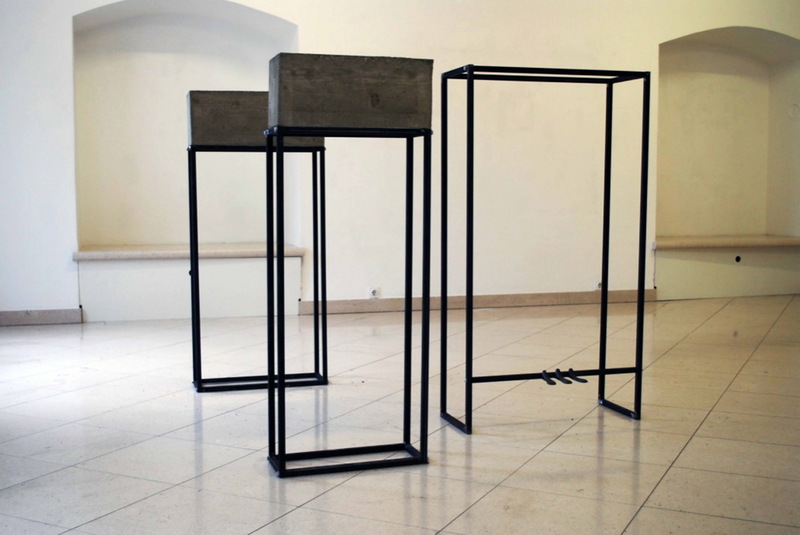 With these historical contexts in mind, Boris Beja created an associative and analytic spatial intervention. His works prepared especially for this exhibition reflect the artist’s utterly istanced view on the period of brutalism, monumental sculpture and concrete music. 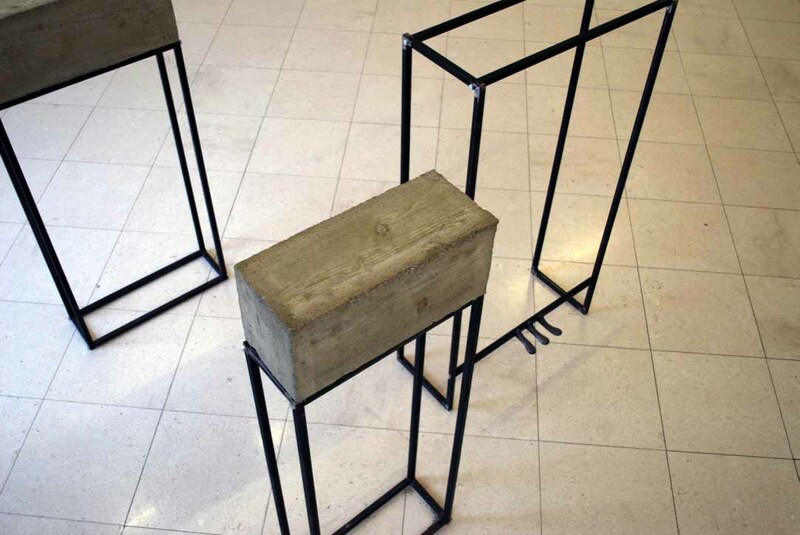 Similarly as many artists of the post-war era, Beja uses repetition of elements, while in the present exhibition, he confronts seemingly incompatible materials, such as wood, metal, glass and concrete. These works are actually ready-made objects, which Beja transfers from the context of (useful) applied arts to the (useless) fine art context – the piano hammers and the metal casts of piano pedals, which thus lose their functions. Alongside this, a sound installation is placed which translates the repetitive noise of a concrete mixer into a more refined composition (composer Tadej Horvat). 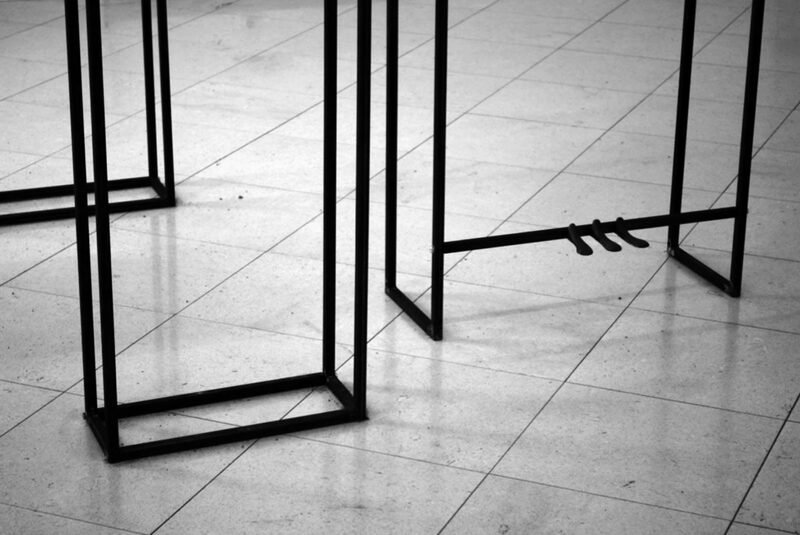 The brutal sound of a construction site mixes with a parquet concert performance.